Farmers and veterinarians share a deep-rooted passion for taking care of their animals. As a veterinarian and mother of two young girls, my husband and I decided to get some sheep to help teach our daughters about caring for animals. The same basic principles of animal care apply whether you have 15 sheep in the old “naturally ventilated” barn or you have 2,400 pigs in a mechanically ventilated barn. Provide a good environment – the right temperature, fresh air, and a dry spot to lie down. For my daughters this means that they help put clean straw in the pen when the old straw gets too wet. In the summer, we had a stir fan and now in the winter we are closing windows and doors to prevent drafting. Ensure good nutrition – adequate balance of energy, protein, vitamins and minerals. When my girls help with feeding this means knowing how many bales of hay to throw in the pen and which type of corn or grain to put in the feed trough. Have clean ample water available – For my daughters this means they are learning that mom will clean out the water buckets every night to get fresh clean water for the sheep. Then they get to fight over who will hold the hose while we are refilling them, which inevitably turns into someone getting really wet! An ounce of prevention is worth a pound of cure – for example, preventative vaccination and understanding the health of new animals before you introduce them into your farm. For our farm, this meant vaccinating lambs at weaning time and deworming sheep as needed. Know when an animal needs Extra TLC – If the animal gets sick or is not feeling well, check their temperature and vitals and work with your veterinarian to determine what treatment is needed. Despite our most valiant efforts to take care of our small flock, we have occasionally had a ewe or a lamb that has gotten sick. The same is true for any farm. Farmers will work with their veterinarians to know what the correct treatment is for a sick animal. Sometimes it can be as simple as giving the sick animal a dose of subcutaneous fluids for rehydration. Other times, giving an antibiotic or anti-inflammatory medicine is necessary to help the animal get back to health. 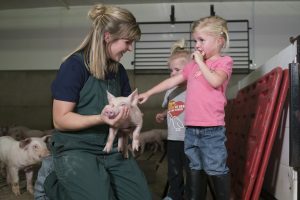 As a veterinarian, when I work with farmers to teach them how to use antibiotics responsibly – we talk about following the directions the veterinarian provides, using only the amount of antibiotic necessary to treat the problem, and tracking your antibiotic use through databases such as PART. Antibiotics are a very important tool in our toolbox to care for our animals. Veterinarians and farmers understand that using antibiotics responsibly is critical for the health and welfare of our animals. United Nations to Discuss Antibiotic Resistance – How Will You Respond?